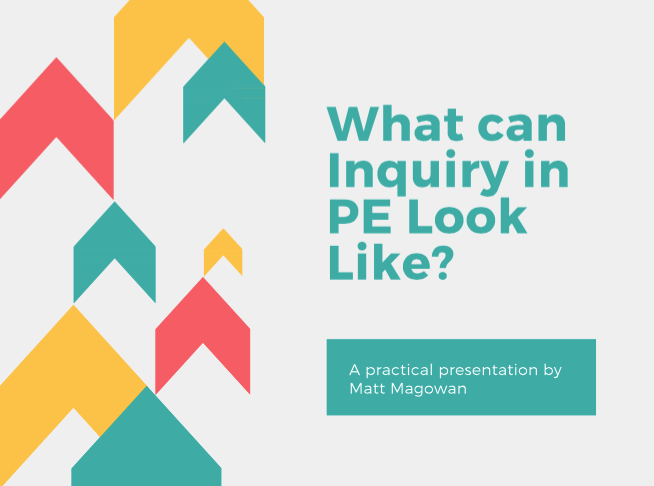 I was recently very fortunate to share my thoughts on personalised learning within PE through a Connected PE online conference. 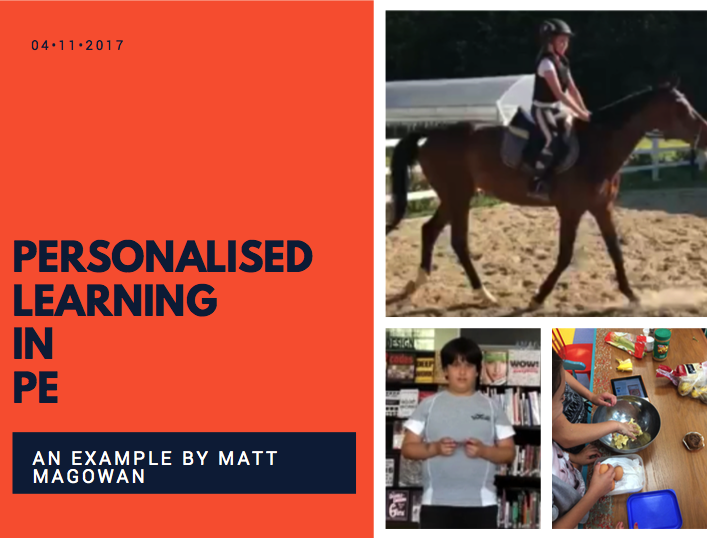 There are many different approaches to personalised learning, in this video I share how Drive by Daniel Pink and The Power of Inquiry by Kath Murdoch impacted my thinking and practise; these books recognise the importance of student choice within learning, preparing students to learn without a teacher and the importance of developing transferable skills i.e. self-management, organisation critical thinking. I often ask myself 'are students taking home what they do in PE and applying it in their lives?’ and 'how am I enabling students to lead more active lifestyles beyond school?' 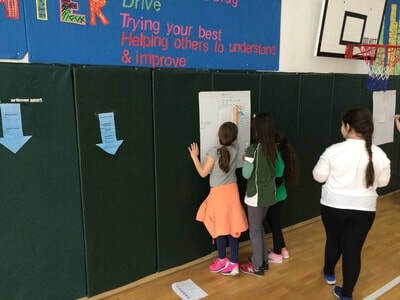 Through these questions and reflecting on the work of Daniel Pink and Kath Murdoch I tried implementing 'iTime' with Grade 4 students; and this is what I shared with the Connected PE community and with you here. I would like to thank Jarrod at ConnectedPE for giving me the opportunity to share my learning journey with others as well as the parents who gave me permission to share the examples of students work used in this presentation and in my blog post on iTime. Connected PE is a fantastic resource for PE teachers - very much a Netflix of PE professional development, you can access all the webinars from this years Connected PE conference by clicking here or sign up for access to 100+ hours of PE PD gold. At the start of November I had the honour of presenting to other PE teachers at the IB Dunia Conference 2017 in Jakarta. 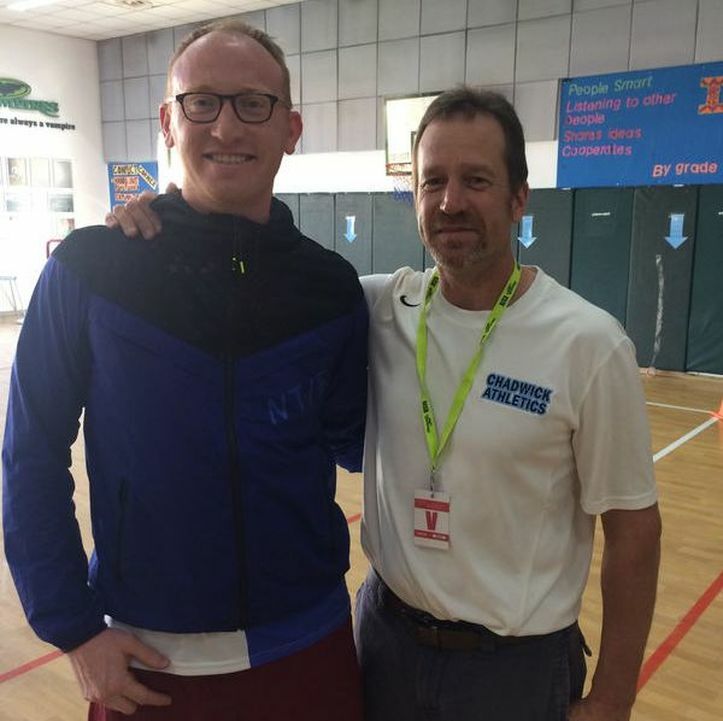 It was a little nerve wracking, but the whole experience was fantastic; it was great to meet and talk to other PE teachers about their experiences and journeys within the PYP and also to hear their reflections on what I was sharing with them. You can access both presentations by clicking on them and if you have any questions, please don't hesitate to get in contact. How can we be more effective as teachers? How can we help students cope with ADHD, anxiety and depression? John Ratey in SPARK cites evidence from an ever growing body of research papers that we can both enhance learning and our ability to cope with daily life by simply getting out of our chairs, increasing our heart rates and getting a bit sweaty. The most pertinent issue for us as educators is the role that exercise plays in optimizing brain functionality; preparing students for learning. The brain is like a muscle. It’s adaptable and elastic; able to constantly change, rewire (neuroplasticity) adapting from our experiences. Over the last 20 years research has dramatically changed our understanding of how connections in the brain develop and grow. Moving our muscles produce proteins (loosely termed as factors) that travel to the brain and stimulate cell growth (Insulin like Growth Factor 1) and build more capillaries in the body and brain (Vascular Endothelial Growth Factor). Brain Derived Neurotrophic Factor is what Ratey & Hagerman describe as the Miracle-Gro for the brain; BDNF spurs the growth of new neurons and ‘fertilizes’ them to keep them functioning and growing. Research has since shown that exercise can elevate the amount of BDNF in the brain -- up to three times normal – to create an ideal environment for learning to take place. Starting in this year at AISB, the Elementary School will be starting the day with a 15 minute timetabled exercise program, similar to the case study of Naperville Central High School in SPARK. 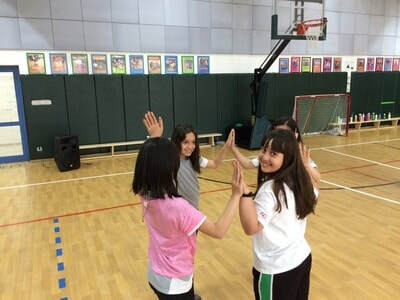 The 15-minute session will focus on heart rate, getting students into a daily exercise routine and creating an optimal environment for their brains to learn. SPARK highlights the benefits of high intensity, anaerobic exercise in releasing the Human Growth Hormone (HGH) that’s vital to the growth of all cells in the brain and body. Typically, HGH stays in the bloodstream for only a few minutes; however, a study highlighted in SPARK showed that a 30 second anaerobic activity generated a 6-fold increase in HGH, which peaked two hours after the activity. Research suggests this created an optimal learning zone, whereby vocabulary words were learned 20% faster by those who had undertaken two 3-minute sprints as part of interval training (compared to subjects who stayed at low intensity). During lessons it is important that students are involved and experience as much ‘game time’ as possible, strategies for reducing teacher talk time and transition time become more critical. The benefits of creating this environment for students go beyond increasing heart rates; ensuring students are engaged, have more time to develop skill and in game decision making. There is an ever growing scientific body of research that physical and mental education go hand in hand. Separating PE and movement from the classroom creates a suboptimal environment for learning. 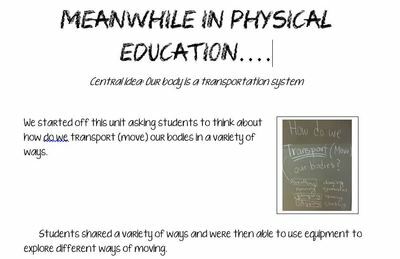 As educators we should be looking at ways to combine physical movement and learning; PE should be daily for the benefit of a students development, not cut to allow more classroom time as is often seen. As Physical Educators we have a responsibility to move the subject towards a progressive future, where our subject enhances and maximises student learning. PE is as important as any other subject, maybe more so. Malcolm Gladwell in Outliers, highlights the work of Robert Sternberg who proposes that intelligence should be rethought of as an ability to perform and is influenced by context; as opposed to solely the mental processes inside a person's head i.e. the IQ test. Sternberg believes that there are 3 intelligences in human cognition; analytical, creative and practical. Analytical Intelligence - Sternberg believes analytical intelligence is based on performance and metacomponents. Performance component are the basic operations involved in any cognitive act. Creative Intelligence - This involves insights, synthesis and the ability to react to novel situations and stimuli. How do we structure our environment to support this? An example of this within PE could be the skill and drill approach where a skill is taught in isolation; students are expected to imitate and repeat the skill in isolation, performing in near total absence of creative or critical thinking. When in a game, do you perform a skill in an isolated setting? 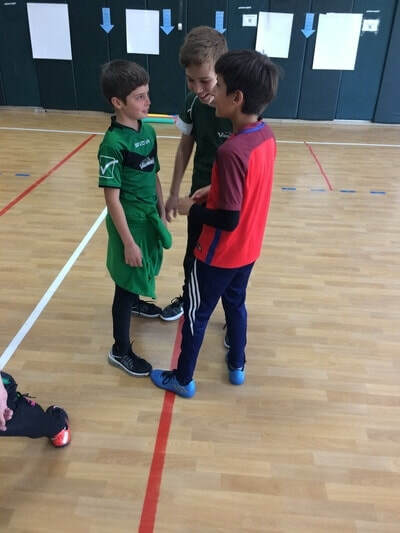 This can compared to a game centred teaching approach where students participate in small sided, modified and structured games (such as TGfU or Game Sense models). 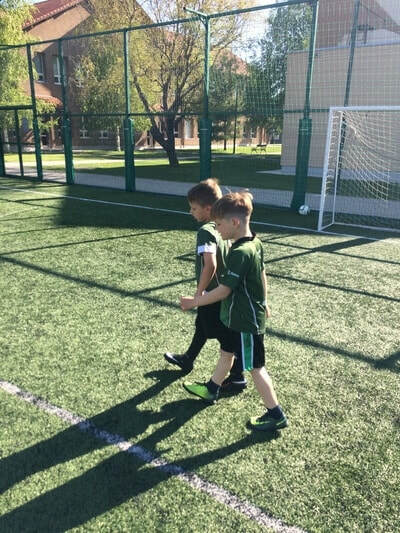 This allows for increased student involvement; whilst creating an environment that enables the student to develop a particular skill within the context of a game. This takes the students ability beyond performing a skill in isolation to having to deal with novel situations created by other players (creative intelligence), whilst having the ability to shape one's own environment or playing space (practical intelligence) by the decision made or executed skill. 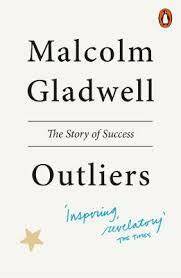 In Outliers Malcolm Gladwell tries to take our understanding of success beyond a simplistic view of the stand alone genius or the innately talented musician or athlete; to a more holistic view of history, community and opportunity. To do this Gladwell uses many different stories of successful (and not so successful) people, analysing what factors enabled them to achieve such great heights, it’s a fascinating and thought provoking read; if somewhat simplistic in his recommendations at times. Tantrums, meltdowns and irrational behaviour can all come from a child (and in a relatively short space of time) What triggers this? How can I use these moments to help the student to develop or understand? 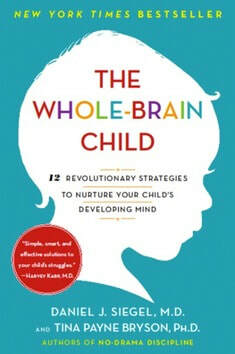 The Whole Brain Child is an easy to read book that gives the reader greater understanding of what the student is dealing with on the inside, how to connect with them and provides practical strategies to turn tantrums, meltdowns or irrational behaviour into a teachable moment. The book provides great insight into the workings of the brain, without feeling like a scientific text book. In the opening chapter on integration; Siegel and Bryson use the analogy of the body consisting of many organs that work together to remain healthy, with the brain consisting of many components that work best when working together. An example of this; with the brain split in two halves the left (logical, linguistic and literal) and the right side (emotional, non verbal and experiential). When integrated we are able to achieve more intricate and sophisticated tasks. Problems arise when the left and right side of the brain are not integrated and working together. There are times that students (or teachers and parents) can allow their left side to dominate; not connecting with the other person emotionally and just dealing with them using only logic. Just as there are times when we allow emotions to take over, divorcing logic from our decisions and feelings. Siegel and Bryson help you to identify when this happens and provide simple and practical examples of how to integrate (or re-integrate) the two halves of the brain. Throughout The Whole Brain Child there are comic strips and real life and relatable examples. The clenched fist example (Brain Model) on page 62 provided a visual and practical example that will help students to identify their emotions, understand why they're feeling a certain way; helping them to calm their feelings. Click image to see an example portfolio piece from this unit. 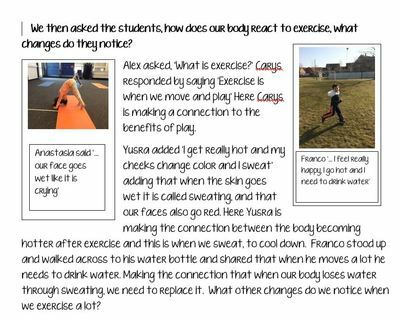 Since January and the visit made by Reggio Emilia educators Elena Giacopini and Mateo Bini I have been contemplating how best to document learning within PE, specifically within Early Childhood, whereby we are able to show the process of learning. The January PD session made me reflect upon my own practice whilst believing in a social constructivism approach to learning, how does my learning environment reflect this? How does my documentation reflect the learning that takes place within my lessons? 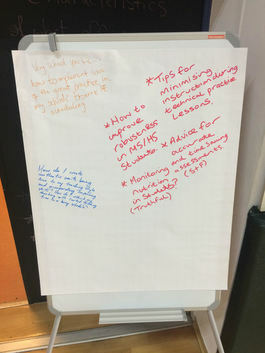 For the purpose of this blog post, when talking about documentation I am referring to what will appear in a students portfolio, documentation of learning happens throughout the unit and guides the inquiry. A particular focus has been how to show the process of learning to the parents so they are aware of this and can become part of the process with their child. Whilst going through this process, we (I team teach KG with Alex Sota) tried to allow more time for student voice and to avoid rushing learning with a perceived need to 'get something done' by a specific time. This enabled student voice to become central to the learning, with our role as facilitators responding to their ideas, interests and conversations. Through making student learning visible, documenting their conversations and working theories students were able to see and reflect upon their learning. As teachers we were able use this information to plan following sessions, leading to more authentic inquiry. Whilst through the inclusion of multiple student voices in the students documentation it reflects the process of student learning, showing understanding and constructing meaning as a continuous process. 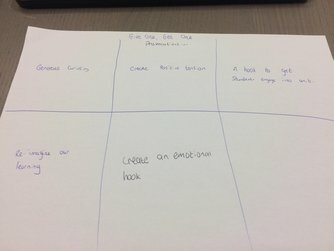 After going through this process I still have many questions; are the connections I have made to student comments really my own connections? Should I have included more of the student 'physical' developments in the portfolio? How or when to is the best time to use a provocation to ensure that all students voices are heard? Did all students really want to focus on the cardiovascular system after feeling their heart beats, or did we as teachers direct this? After reflecting upon the Grade 3 Invasion Game unit (which you ca read about in the 'Inquiry Teaching' section), myself and Mr Sota who I co teach Grade 3 with decided that the this unit, would work really well as an adventure challenge unit in the future; with emphasis on teamwork and creative collaboration. As part of the CEESA Job A Like I planned to share the presentation above, though due to time restraints ended up highlighting the unit using Kath Murdoch's inquiry cycle as an overview. Please click on image to see the presentation. 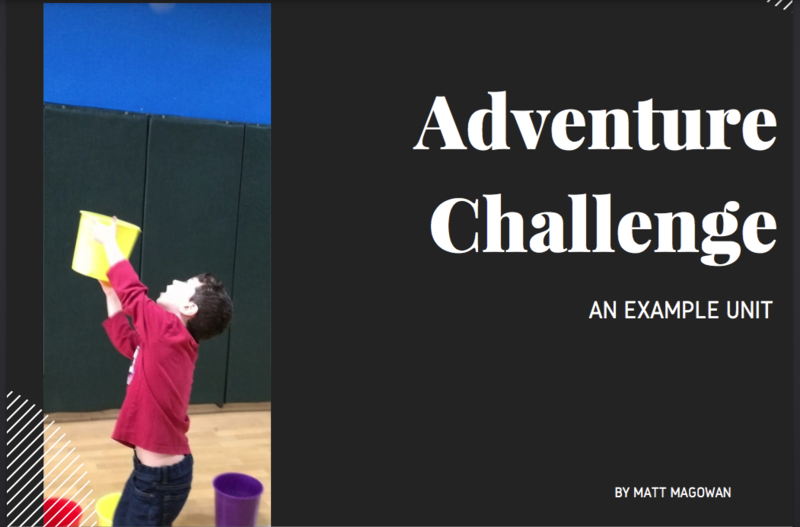 * Being an active member of #physed and using my blog more to reflect on my teaching practice. * To spend more time on creating my provocations, to get students hooked right away in the unit, using @NoTosh brainstorming tool. A big take away from the conference was the organisation of time & equipment and the environment that this creates for learning. I was particularly keen to record my teacher talk time, whilst believing that my classroom environment is a place that students are actively involved in the process of learning and that students are teachers in their own right. Does my practise reflect this? During #AISB17PE Andy talked about teacher talk time and I set myself a new target of 20-30% , with this I took my stopwatch to my lessons. Teaching across various age ranges (KG, Grades 1, 3 & 4) I recognise that my teacher talk time already is somewhat dependent upon the age group I'm teaching, talk for over a minute to my KG group and a glazed over look or fidgeting tells me they are not engaged. Recording my teacher talk time over the last month has been an interesting experience, dependent upon the lesson and the stage of the unit students are in my talk time has been from 17% up to 42%. Recording my teacher talk time over the last month has been an interesting experience, dependent upon the lesson and the stage of the unit students are in my talk time has been from 17% up to 42%. Walk and Talks; a strategy modeled by Andy where students partner up walk and share ideas and reflections on a set topic and then share with the wider group has been the biggest change in our classroom environment. This has enabled students to understand, construct or develop new learnings for one another. As students have gone through the units, walk and talks have enabled students to explore and pose more wonderings; helping us to go deeper conceptually. I have also used 'Compass Points' to get Grade 4 students to give feedback on their fitness circuits that they have designed to try and improve 3 different components of fitness, this enabled students to receive feedback from their classmates in a quick way. I also found that students were more honest and open to constructive feedback that they received when doing this, in comparison to giving feedback face to face. Andy also showed us quick ways to get the class divided into teams, these generally got students up and running as soon as they came in and when a signal was given students had to go toe to toe or back to back etc, anyone who didn't get a partner or part of a group could meet up in a already assigned friendship area. This has helped a lot in reducing inactivity, and also has led to a decrease in behavioural issues as upon reflection these issues occur during 'down time' and by reducing this transitions between activities have been a lot smoother. 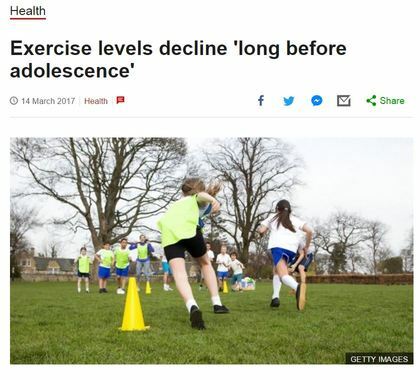 ​Newly released research from the UK shows that physical activity rates are on the decline for boys and girls from the age of 7. As highlighted in my blog post on Balanced and Barefoot by Angela Hanscom, a move towards a more sedentary lifestyle has a big impact on a child development impacting among other aspects of life, attention skills, controlling emotions, balance, decreased strength and endurance and a weakened immune system. Whilst a move towards a swipe culture and a decrease of outdoor play areas should be looked at, the research suggests that the decline happens early into a child's school life. Could this be because there has been a shift towards a more school-ish view of child development? Emphasis moving towards classroom and away from children learning through free play. This could be supported with the decreases currently made to recess times around the world. What does this also mean to me as an Elementary PE teacher? Is the curriculum that I'm delivering only engaging students during our contact time? Should we not strive to inspire kids to play outside of school time? How do we do this? What are the prohibiting factors? 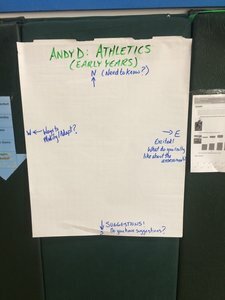 This was my teaching philosophy that Andy Vasily asked us to write down on a post it note prior to the first session on provocations at the CEESA PE workshop. Andy stated (in hindsight, maybe as a provocation) that our role was to be mentors and to ‘forget about physical literacy’. Was this a planned provocation? Regardless, it certainly got my attention and created positive tension. I like Rachel Browns definition of a provocation from her blog, where she says ' ..ultimately the intention of provocations is to provide an invitation for a child to explore and express themselves. It should be open ended and provide a means for an expression where possible....' Andy gave provocative examples he's used throughout his teaching, his videos in particular created an emotional hook. 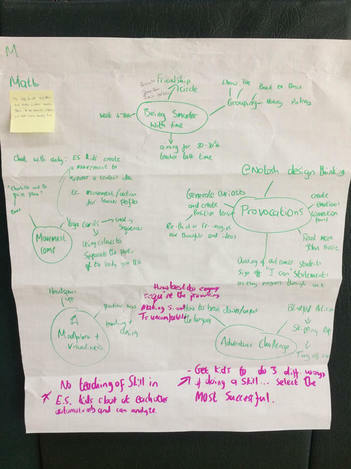 The most useful tool was the @NoTosh brainstorming template;used when designing a provocation for an athletics unit (for a closer look at this please click here). The provocations that Andy shared throughout the conference created an emotional hook, combined with @NoTosh brainstorming template I hope to find new, more creative ways that get students to rethink or reimagine their thoughts and learnings. How can we ensure a provocation creates an emotional hook for a whole group? This was my learning nest after the workshop. 1 minute Ted Talk – At the end of the conference we had 1 minute to share our learnings, or further questions from throughout the conference. 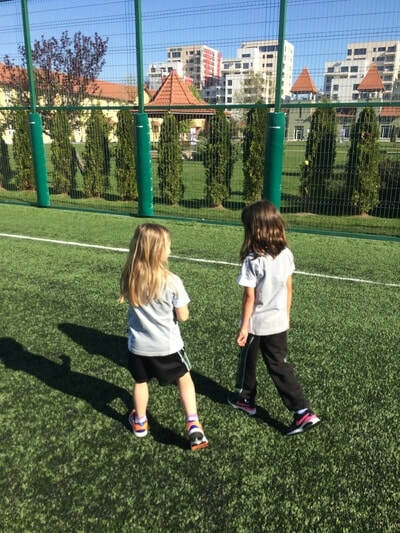 Walk and Talk – With a partner walking around the space sharing ideas and reflections. Parking lot – After the walk and talk we are able to post any questions that you had which followed that session. 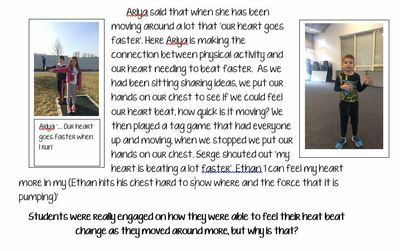 Parking Lot - After walk and talks we were able to post questions or wonderings that we had. Demo Slam - Split groups into 8, each participant had to share their main takeaway from the session in 20 seconds. Compass points used during our gallery walk of assessments. Gallery Walk - Assessments hung around the gym, walk around a do a 'Chalk and Talk'; where participants walk around, looking at the work that is displayed and adding their thoughts to it using the compass points as a guide. Give one, Get one - This was on provocations; what we thought they were and their role. A 10 week intensive, pull out program led by @PEAndyD. It is a MRT (motor remedial program) for children 7 and under who do not have appropriate gross motor skills for their age. Something else shared by @PEAndyD was to get students to create a movement that represents each word of the central idea creating a sequence. repeat throughout the course of the unit and the students will know the central idea. We did it and it was great!